Posted on Tue, Feb 21, 2012 : 5:57 a.m.
Dan Crary headlines this year's BreakFEST concert. The annual BreakFEST benefit concert, which raises funds for Ann Arbor’s Breakfast at St. Andrew’s program, will kick off its third year Friday with a tasty bill that includes a blues innovator, a duo with strong alt-country roots, a great Michigan folk performer, and one of Detroit’s top Irish musicians. Topping the bill is Dan Crary, an innovator in the world of guitar flatpicking. Also appearing are The Small Ponds, which pairs Whiskeytown-alumna Caitlin Cary with singer, songwriter and multi-instrumentalist Matt Douglas. 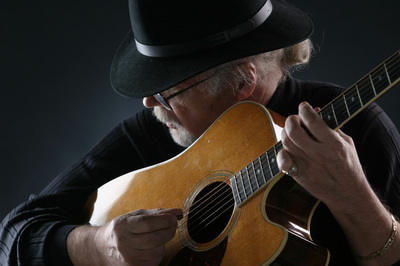 Joining them will be Kalamazoo-area folksinger-songwriter Joel Mabus, who will perform and host the concert, and an Irish CÃ©ilÃ­ band led by Mike Gavin, from Motown’s first family of Irish music. The show will be at The Ark. The performers are donating their talents, so all profits from BreakFEST 2012 will go operate the all-volunteer Breakfast at St. Andrew’s. “Combined with the first two, we’ve raised about $23,000 to feed the hungry. The reason (BreakFEST) works is we just get fantastic support from businesses in the community that offsets the cost of actually producing the show. The artists have been really generous in donating their performances, and we’ve had great attendance, even on the coldest snowiest nights,” said Jim Cain, event producer. Who: Dan Crary, The Small Ponds, Joel Mabus (performer and host), plus an Irish CÃ©ilÃ­ band led by Detroit’s Mike Gavin. What: Benefit concert for Breakfast at St. Andrew’s Episcopal Church, the long-running local program that serves a free breakfast every morning to anyone in need. When: 7:30 p.m. Friday, Feb. 24. The performers donate their talents, and community sponsorships help defray the costs—booking the space, travel expenses and everything else associated with the show. This year’s top sponsors are Excelda Manufacturing, The Mosaic Foundation of R. & P. Heydon and Bank of Ann Arbor. Cain said that supporting the BreakFEST concert is a great example of making a difference locally, adding that it’s not just the homeless who are served by the program. “A lot of the people who come to a program like the Breakfast at St. Andrew's are actually working people who need help making ends meet. Daily meal programs like the breakfast are just as important to them as they are to someone who is even worse off,” Cain said. Although he doesn’t live in Ann Arbor, Mabus said that when Cain contacted him he was happy to help out. He will do a short set at the beginning of the show, then act as host for the rest of the evening. Mabus, who performed his pro-state song “The Lights Are On In Michigan” to great audience response at a Michigan Theater show with Jeff Daniels in November 2010 and also on public radio’s “A Prairie Home Companion” in 2011, said he plans to play the song at the benefit show as well. this is going to be a treat for me to reconnect with Dan,” he added. A CD of the 2010 BreakFEST concert is available locally at Herb David Guitar Studio and Nicola’s Books, with proceeds also going to benefit the St. Andrew’s program.